I'll bet you are all safe and comfy in your home relaxing in front of your HD TV watching something semi-mindless about some human who is famous for some reason that no one can actually pinpoint. Well, there is a serious situation brewing in the world of metrology. Yep, you heard right! 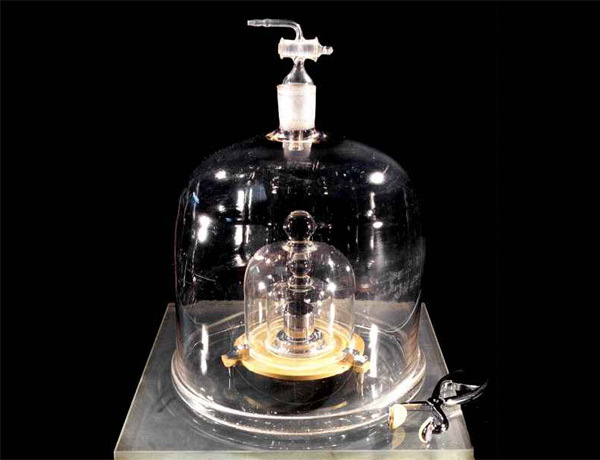 Metrologists are embroiled in a feverish battle over the definition of the kilogram! OH NOSE! Metrology is the study of measurements. Yes, they measure measurements. Quick synopsis: Around 1889, the French set the SI (metric) system into being. It caused great consternation and more than one brain implosion. However, it was a working system that did not rely on some obscure King's body part sizes. Below is a chart of the original definitions versus today's definitions I made a few years back to show during the Intro Physics lessons. 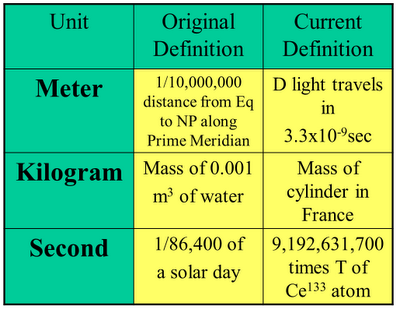 Note the original definitions of Kg, m, and second. Well, obviously they don't work anymore. The meter can't trust the size of the earth to be a constant since the earth is dynamic and shifts, shakes, and burps constantly. The definition of the second is just as problematic. Even the rotation of the earth on it's own axis and revolution about the sun aren't as constant as one would hope. 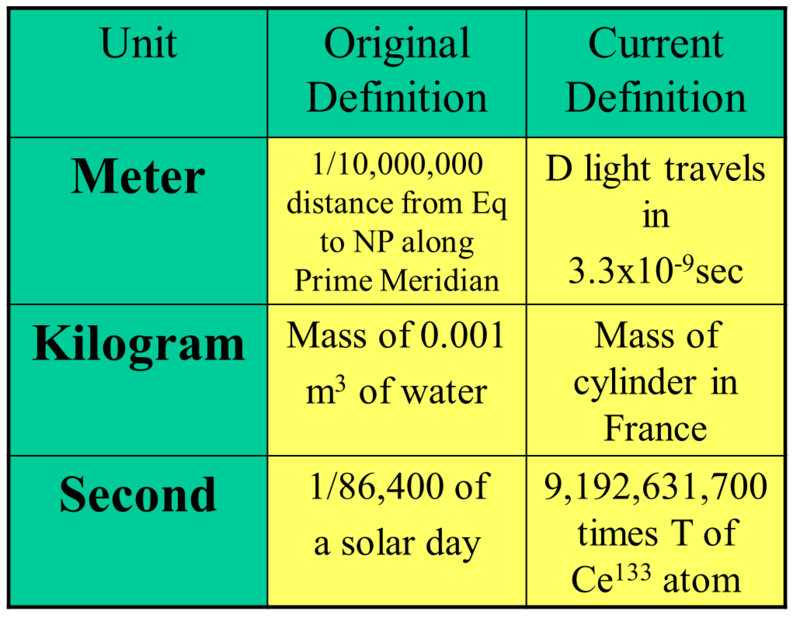 So, the meter is now well defined from the speed of light, one of the most well-defined physical constants we have, and the second is defined as a specific number of vibrations of a cesium atom, also a well-defined constant. Cool. Constant. Well-defined and reproducible in any real laboratory. Now, the Kilogram. It's the problem child. The evil twin. The outcast. 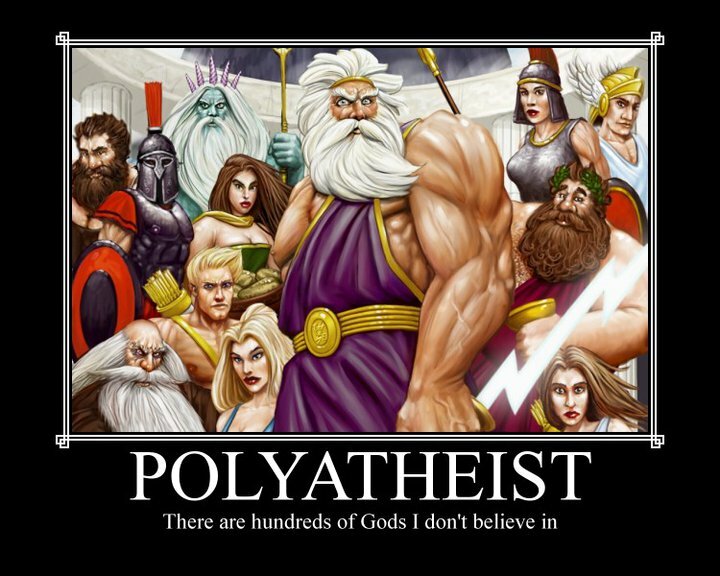 Notice it's original definition was based on water. Not a good idea since density of water changes due to altitude and temperature and other factors. The "new" definition is the mass of a platinum/iridium cylinder in a quadruple vacuum jar in a vault at the International Bureau of Weights and Measures (BIPM) in Sevres, France. Yeah, that's nice. Have a standard that is locked up and no one can touch it. Nice standard. For many years, 30 or 40, scientists have been looking for a better way to define the standard unit of mass using similar comparisons like the new meter and second; based on unchanging physical constants. Well, looks like an answer has been found. Seems the decision guys are taking two very different methods and AVERAGING the results and defining the kilogram as that exact number. Yep, seems arbitrary. Mathematicians are fine with the procedure, but physicists don't like it one bit. According to Nature Online: "Deciding to just average these two results would be perfectly proper mathematics, but it would not be science," says Michael Hart, a physicist at the University of Manchester, UK. The two methods? METHOD #1: Quoting from Nature: ...a 'watt balance' — a sophisticated scale — weighs the kilogram using electric and magnetic fields. The mass measurement can then be used to define the kilogram in terms of Planck's constant, a number used in quantum mechanics. METHOD #2: Again, quoting from Nature: ...involves counting the atoms in a sphere of crystalline silicon. That result can be used to redefine the kilogram in terms of Avogadro's Number, which relates an element's atomic mass to its bulk weight. Media Ignorance at its Ugliest!